I have uploaded a video to our YouTube channel that illustrates how to use UAVs with our software. (Be sure to change the video quality to 720p if you have a good Internet connection!) In this post I’d like to cover the topic in more detail than the video and accompanying description allows. 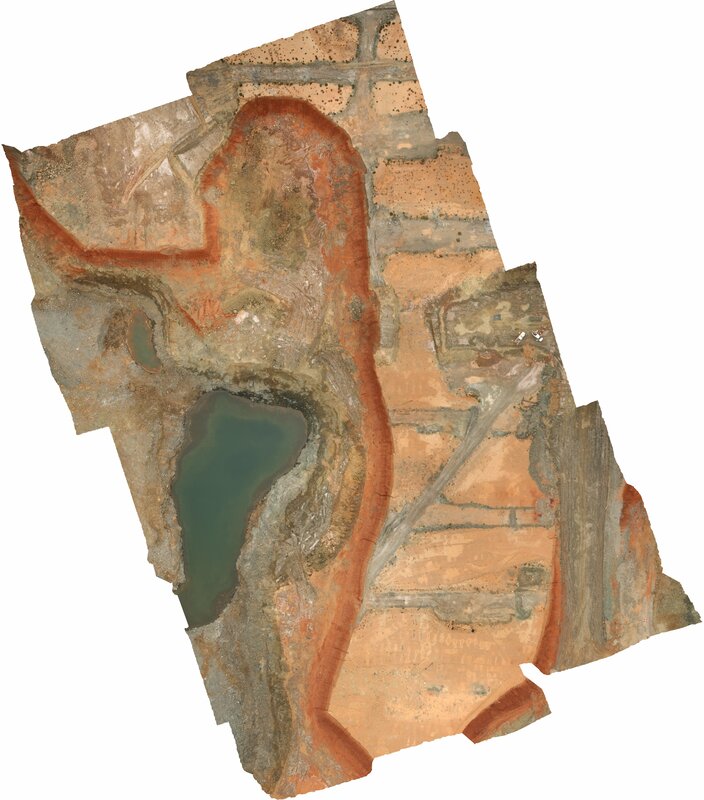 ADAM Technology has been involved with using and optimising Unmanned Aerial Vehicles (UAVs), also known as Unmanned Aerial Systems (UASs), for aerial photography since 2006. A prototype from early 2007; a Rotomotion SR20 with modified undercarriage to carry a digital SLR. During this time UAVs have evolved from R&D prototypes into a valuable surveying and mapping tool. The design of the A.I.Tech 880MX shown in the video, for example, takes into account the experience gained over that time, and features dual-redundant down links operating at different frequencies with automatic failover in the case of a loss of communication on one link; the ability to conduct an entire flight fully autonomously, including landing; a flybarless head design for added efficiency; and well over a hundred hours of flawless operation producing data just like that shown in the video (which, in fact, was just one project from 11 that it flies every month at one customer’s site). A.I.Tech 880MX, co-designed by Nigel Brown, who is shown operating the prototype UAV in the previous picture. Being an aerial platform, they can achieve the perfect vantage point for a number of important applications, including stockpile volumes. Being autonomous with on-board GPS, they reliably and repeatedly produce images with the correct separation along straight flight lines at the correct distance. The complete flight path for a single flight of the 880MX, demonstrating straight flight lines. Time in air: 14 minutes 6 seconds. Distance travelled: 7 km. Area captured: 65 Ha. 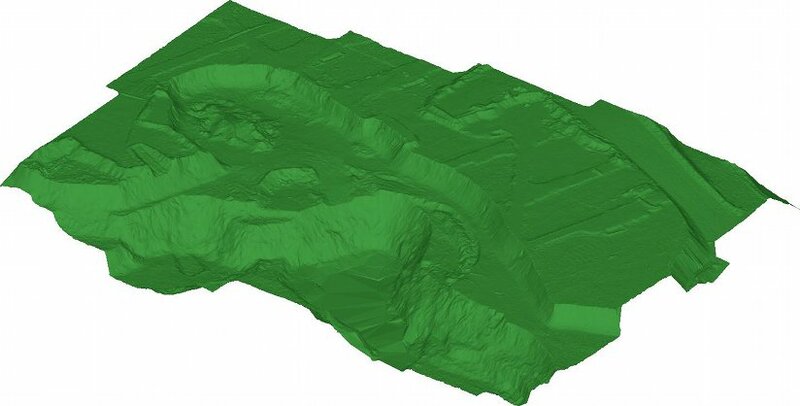 UAVs could also conceivably be used with other remote sensing technologies, like LIDAR; however, the huge advantage of using them for photogrammetry instead is that a digital camera is an extremely cheap and light-weight payload compared to a laser scanner and associated IMU; this means a cheaper and lighter UAV can be used to produce more accurate and denser data, and if something goes wrong the financial consequences are far less serious. In addition to conventional cameras, at least one customer has used a thermal camera in conjunction with our software and a UAV to map hot spots in a sensitive area. Capturing images twice as frequently increases the overlap from 60% to 80%. If an image doesn’t turn out, it doesn’t mean we end up with a hole in our data — we simply switch to the neighbouring image instead and continue on. (So if there was a problem with image 5 in the sequence 1-3-5-7-9, we could instead use 1-3-4-6-8-10.) With an 80% overlap, two images in a row would have to be unusable before we actually had a problem; this is so rare that we accept that risk, but if it was common enough to be worth the effort, we could increase the overlap to 90% — again doubling the capture frequency — and then four images in a row would have to be bad before it affected our ability to generate data for a particular location. If we want more detail and accuracy (and an improved ability to see beneath infrastructure like conveyor belts, for example) then we can actually process all images at a cost of longer processing times. In the case of the project on the video, using all images instead of every second image results in over 20 million points in total — more than 50 points per square metre. In this case, bad images will result in areas of lower density (i.e. the same density as we would get by just processing every second image to begin with). If we want to double-check the accuracy of our data, we can process the two sets of images independently and then compare their DTMs. In the case of the project on the video, comparing the final surface models generated by all the even-numbered images vs all the odd-numbered images revealed a mean difference of 3.6 cm, well within our stated accuracy of 5 cm. I have briefly referred to control points before, in “How Does Photogrammetry Work?”, “How Accurate is Photogrammetry? — Part 3”, and “Residuals”, but I should probably explain them in a little more detail. 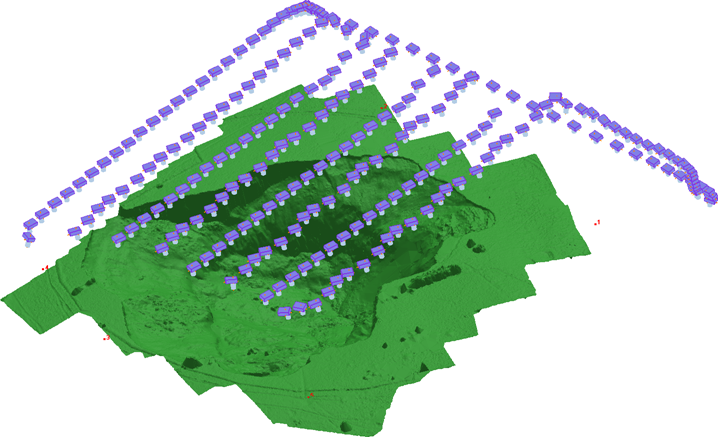 Control Points, which are points that are in one or more images that we do have 3D location information for in advance, typically by surveying with GPS, a total station, or even a previous 3DM Analyst Mine Mapping Suite project. 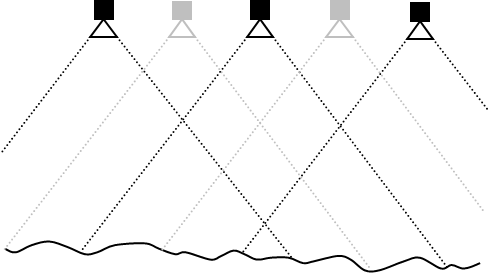 Relative-only points, which are normally generated automatically by the software (as shown in the video) by simply looking for common points between images, are useful for figuring out where the cameras are in relation to each other and what direction they are pointing in — their relative orientation. The Free Network Resection and Bundle Adjustment use the image co-ordinates of those relative-only points — and nothing else — to establish that relative orientation. (Step 3 in the video.) Once the relative orientation has been determined, 3D co-ordinates for all of those points are calculated, and that is what is shown in the 3D View just after the 3 minute mark in the video. 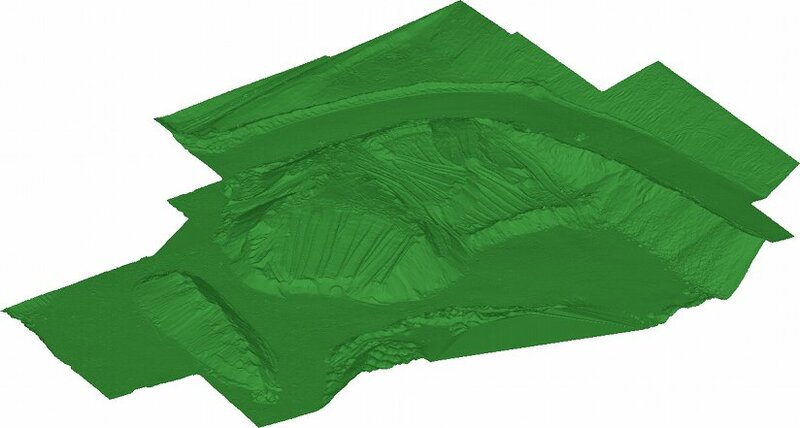 As explained in my post on residuals, once 3D co-ordinates have been determined, the software can project those 3D co-ordinates back onto the original images and compare the image co-ordinates derived from those 3D co-ordinates with the image co-ordinates that were originally determined by the matching process. If a small number of points have large residuals, it suggests that the points did not actually correspond to the same location in the scene and so we call those “bad points”; the software can actually remove those bad points itself, automatically, which you can see at the 2:40 mark in the video — in other words, not only does the software generate all the information it needs to in order to establish the relative orientation itself, it can even detect when it’s made a mistake and clean it up! Control point layout for the project in the video. Control points should, ideally, bracket the area of interest. This is because the further we venture from the area surrounded by control points, the more any error in those control points is exaggerated. Interpolation between control points will be more accurate than extrapolating beyond the control points. Placing all of the control points close together in one corner of the project will greatly diminish the value of those control points. Note that the three control points I chose to digitise in the beginning (1, 3, and 6) also happened to be widely dispersed. This gave an initial exterior orientation that was accurate enough that the remaining points could be picked up successfully. 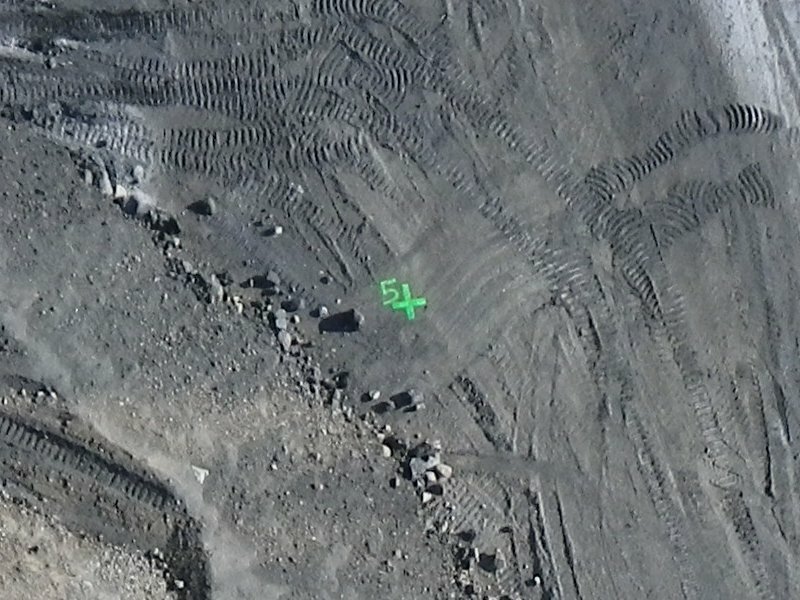 Closer view of the circular targets used by the mine site in the video. These have the advantage that the software can automatically find their centre very accurately (better than 0.1 pixels), provided the user either clicks in the vicinity (first three control points) or the software can predict their locations (remaining control points). If the control points are semi-permanent (as these are — note the star pickets holding the control point in place) then the effort to create them can be worthwhile. 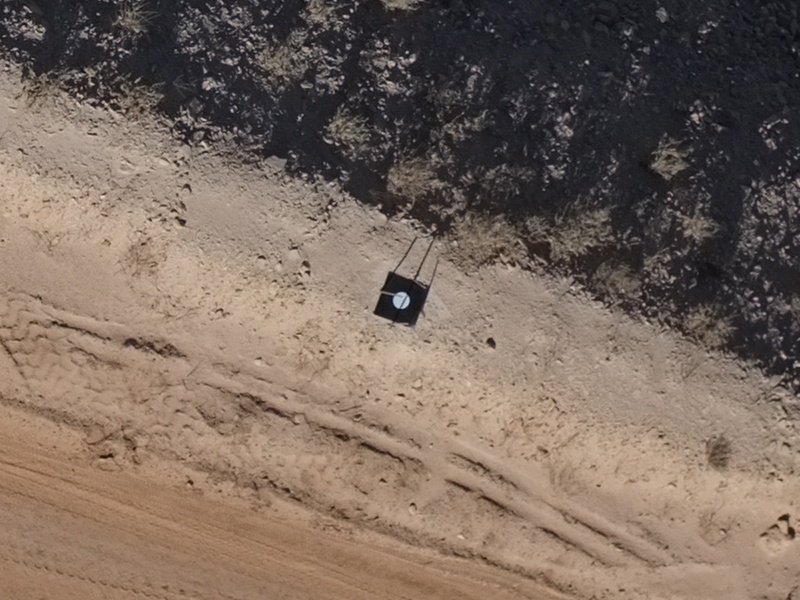 A painted cross used as a control point by another mine site with their UAV. Painting the number next to the control point is very helpful! The underground projects YouTube video shows how control points can be digitised by hand, and although it’s certainly less convenient, it would have added only about one minute to the time required to complete this project. Conventional GPS is normally used for UAV navigation because its accuracy is perfectly fine for following flight lines to the required accuracy for aerial photography; for camera locations, however, differential GPS would normally be required to get close to the accuracy possible with ground control, adding expense. Because the aircraft is in motion, differential GPS will still normally be not as accurate as differential GPS on the ground. Errors can be harder to detect. On the other hand, it’s certainly very convenient to simply fly a project and not have to place and survey control points at all, so there is a strong desire to do this; as a consequence, we recently added the ability to batch-import camera stations to use as part of the exterior orientations and will continue to refine this workflow. The workflow being followed features prominently throughout the video. In particular it is worth noting that control points are used to determine absolute orientations quite early on, before any DTMs have been generated. Not all systems work this way — some actually generate the DTMs using the relative orientations (so the DTMs are in an arbitrary co-ordinate system) and then convert the data into the desired co-ordinate system by digitising the control points on the DTMs and performing a Helmert transformation (i.e. translation, scale, and rotation) to georeference the data. Using the control points to construct a Helmert transformation after the data has already been generated removes any possibility of the control point information being used as an input to the bundle adjustment to improve the accuracy of the orientations. All inputs have errors, including the relative-only point locations and the camera calibration, and using all available information — which includes control point locations and their associated accuracies — means the optimal solution can be found. Separating the absolute orientation into two steps — a relative orientation followed by a Helmert transformation — prevents this. The accuracy with which points can be digitised on a point cloud/DTM is far lower than the accuracy with which points can be digitised in an image, mostly because the point cloud is a lot sparser than the image pixels. It’s also more difficult and error-prone. 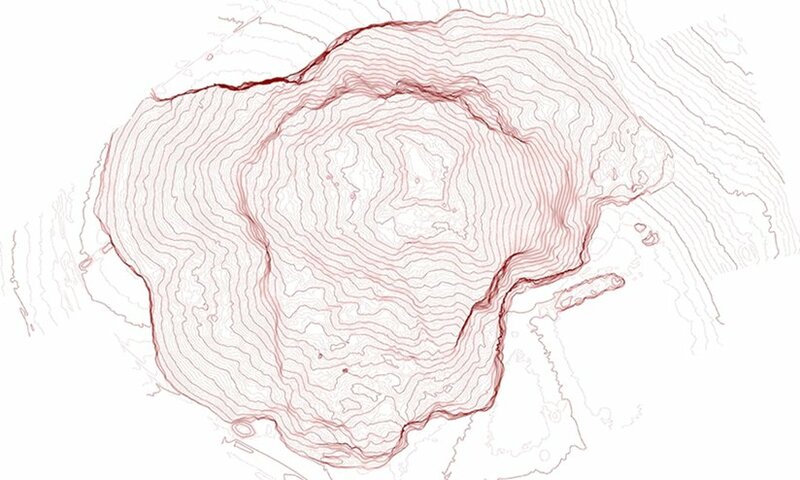 This, in turn, lowers the accuracy of the georeferencing. As mentioned before, our software’s automatic circular target centroiding is accurate to better than 0.1 pixels, and the typical manual control point digitising accuracy is about 0.2 pixels. Any problems with the control points are identified early on, before too much effort has been expended. That particular project area was about 300 m x 365 m and was captured with 37 images in 9 minutes from an altitude of 115 m. It takes 14.5 minutes to process the images and generate over 9 million points. That DTM consists of 2.3 million points generated from ten images and took 7 minutes to process. An orthophotomosaic can be downloaded from here and an image of the contours from here. The launch site (where the first image above was captured) is the raised area on the upper-right with the two lumps in it (from the two vehicles). The area was about 300 m x 200 m and the height variation was about 35 m. The point density was about 40 points per square metre, or about one point every 15 cm. It took 17 minutes of flying to capture the 630 m x 440 m area and about 1 hour of processing to generate 29 million points. After several years of refinement UAVs have now proven themselves extremely valuable for an important range of applications. Coupled with our software they make an extremely attractive option indeed! This entry was posted on 29th August, 2012, 4:22 pm and is filed under FAQs, Tips. You can follow any responses to this entry through RSS 2.0. Both comments and pings are currently closed.